Product #21426 | SKU 9300 | 0.0 (no ratings yet) Thanks for your rating! 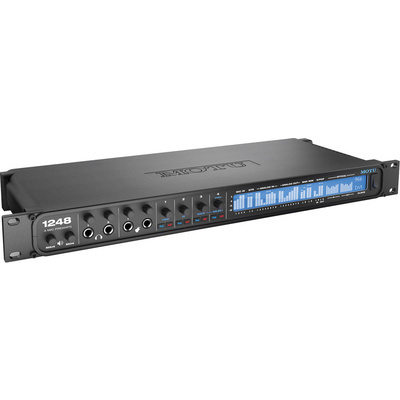 The MOTU 1248 - Thunderbolt and USB Audio Interface With AVB Networking and DSP (32x34, 4 Mic) is designed for studio recording, installed sound, and live sound reinforcement applications such as mixing a band in a club or music venue. The 1U 19" rackmountable device features four balanced microphone inputs with individually switchable +48V phantom power, two dedicated hi-Z guitar inputs, 8 x 12 balanced analog with separate main and monitor outs, 2 x 8-channel ADAT optical, and RCA S/PDIF (with sample rate conversion), for a total of 32 inputs and 34 outputs. Additional I/O can be added to the system through AVB networking.